On Monday, Amazon slashed prices on its 8.9-inch Kindle Fire tablets. If you missed that sale, you're in luck; it's back today, and this time applies to all Kindle Fire models. Oh, except this time you've got to be a mom. The sale, limited to Amazon Mom members who also have Amazon Prime, includes $20 off a Kindle Fire, $25 off the 7-inch Kindle Fire HD, and that same $50 off its 8.9-inch big brother. It's a great deal all around, especially considering how much value these products represent in the first place. For the uninitiated, Amazon Mom is a maternally focused Amazon membership that offers steep discounts on Subscribe & Save for diapers and wipes and other mom things. Most important to you, though, is that it's free to join, and you don't really have to be a mom. Is Amazon just in the spirit of holiday giving? Maybe, but there are likely other forces at work here. Amazon had expected Monday's 8.9-inch Kindle Fire HD sale to clear out significant inventory; that it's running the same promotion (albeit on a smaller scale) suggests that perhaps that goal wasn't met. 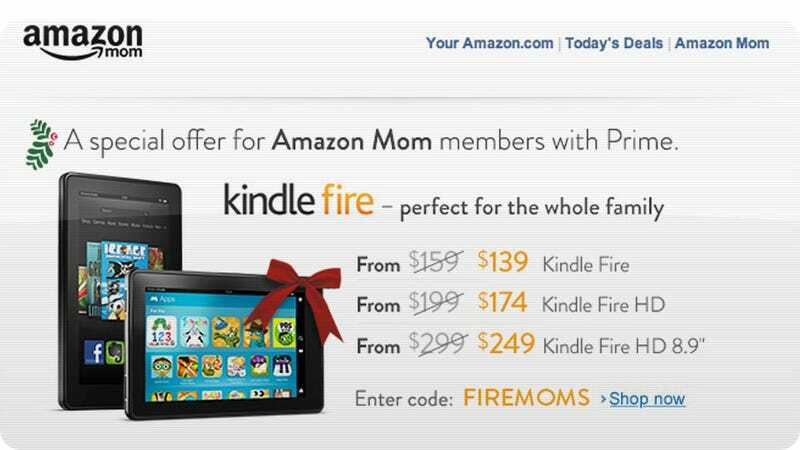 Targeting Moms, meanwhile, serves the double purpose of keeping the sale low-profile (and staves off a run on the hugely popular 7-inch Fire HD) and shepherding kids into the Amazon ecosystem while they're young. Is Amazon&apos;s 8.9-Inch Kindle Fire HD a Flop? But that's all Amazon's problem. All you need to worry about is that a great, cheap tablet is cheaper today, if you're mother—or if you say you're one on the internet.